The original Dark Tower, scanned from an original printing, authorized by the Judges Guild, with new material! 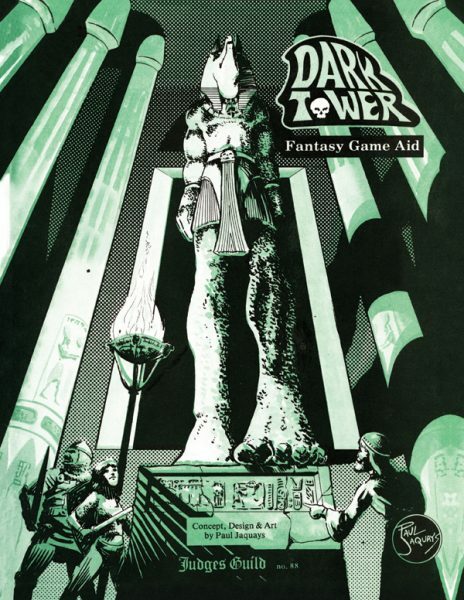 The classic Judges Guild dungeon module Dark Tower as designed by Paul Jaquays! A 70-page scenario, including four detailed dungeon levels, a village, and other items: new monsters and artifacts, the history of the area, and more... an ancient evil has overtaken a once holy shrine; thus, a sleepy mountain hamlet becomes the focal point for strange disappearances and even stranger legends. Goodman Games has teamed up with Judges Guild, the original independent fantasy gaming publisher, to put the �adventure� back into fantasy gaming! Judges Guild adventures are where the settings are large and wondrous, but the details are left up to you. They�re where fantastic powers arise from the very dust; where each quiet village along the road may contain untold wealth � or unspeakable evil; and where each mile of the long, long road calls for a strong sword arm, a whispered prayer, and a ready spell.